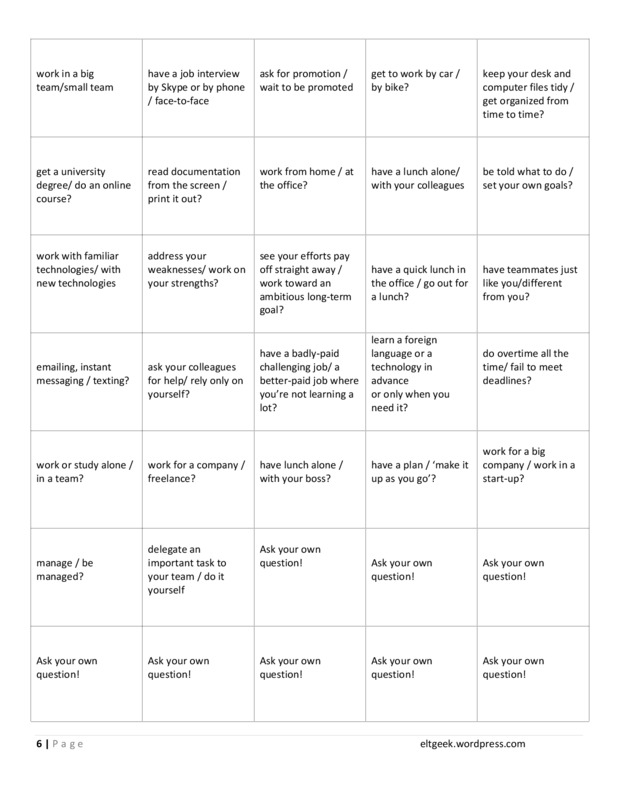 In this post I’m sharing an Excel template that takes a list of questions and answers, chooses twenty random questions from the list and produces a printable grid that can be cut up into separate two-sided cards (with questions on one side and answers at the back). 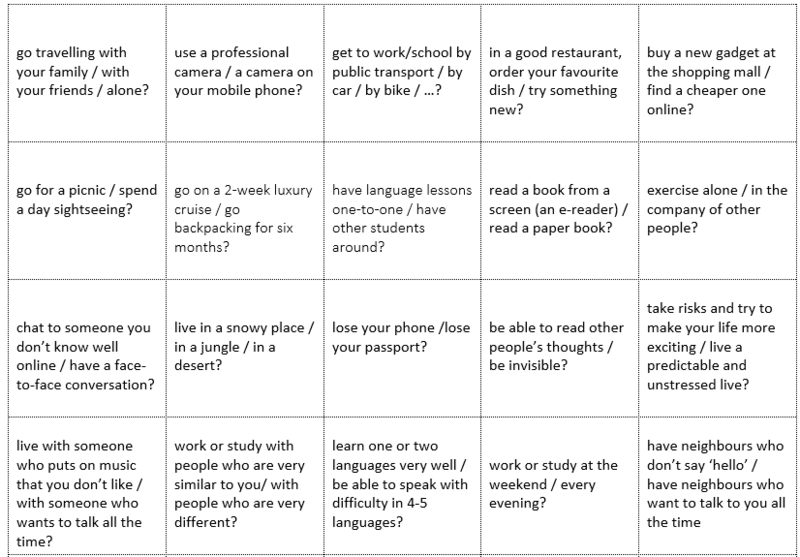 I create cards using both my own sets of questions and sets exported from Quizlet, and use these cards with board games (e.g. 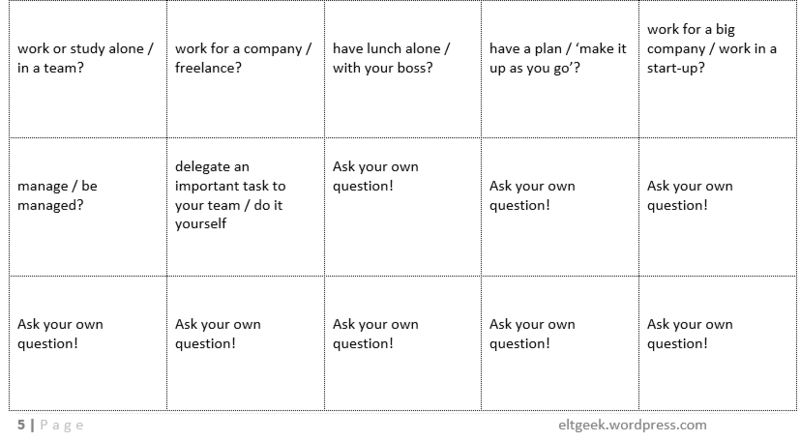 Snakes and Ladders or Tic-Tac-Toe) – you’ll find instructions how to export cards from Quizlet and a list of suitable games in the second part of the post, along with some links to board templates. 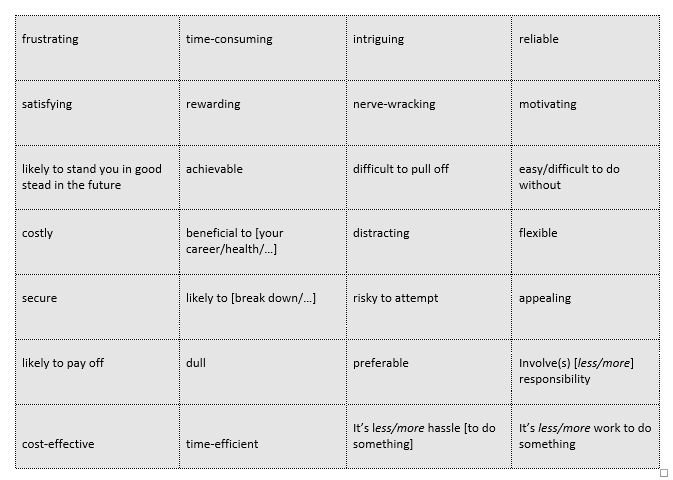 I got the idea a few weeks ago as I was reading a great post by Tekhnologic about a tool that he created: over the course of the year, he accumulates discussion questions in an Excel file, and his tool chooses 9 random questions from the list and arranges them into a 3×3 Tic-Tac-Toe grid, for the students to discuss and play. 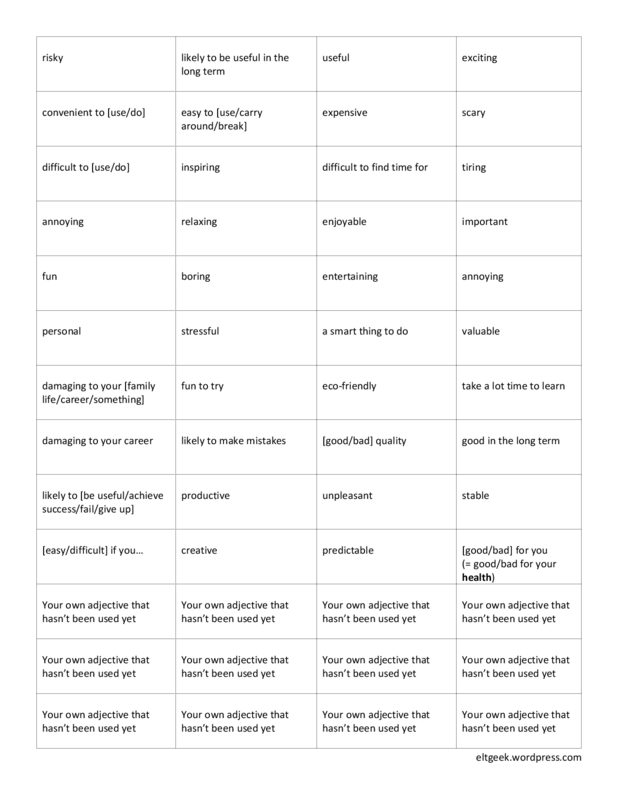 Reading that post, I realized that I needed something very similar to revise language feedback that I type up for my students. I got the Excel document created by Tekhnologic to produce the cards, by playing a bit with his formulas, so now it takes me about five minutes to create, print and cut-up cards for a revision game. Thank you Tekhnologic!! Preparing the cards using the Excel template. If you have a long list of questions and want to revise some of them, use this Excel file: randomiser template. 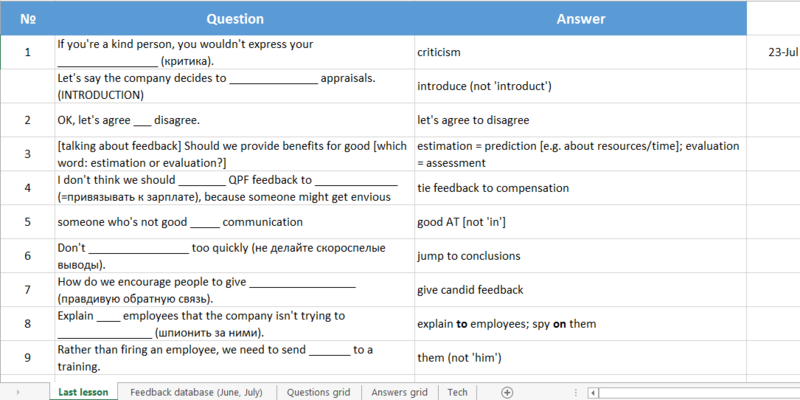 Alternatively, if you have a small set of up to 20 questions and want the students to revise them all, use the 20 cards template. 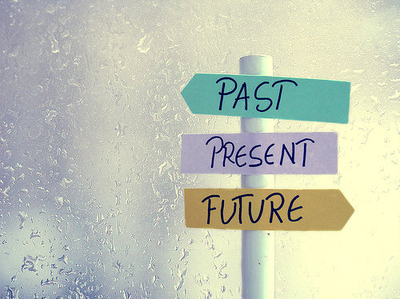 Create the questions: open the ‘Question database’ tab. 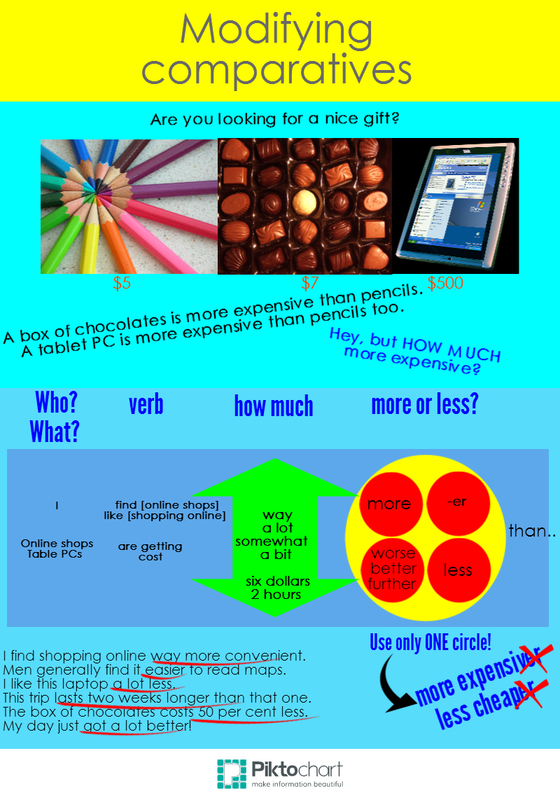 Insert or type your questions and answers. 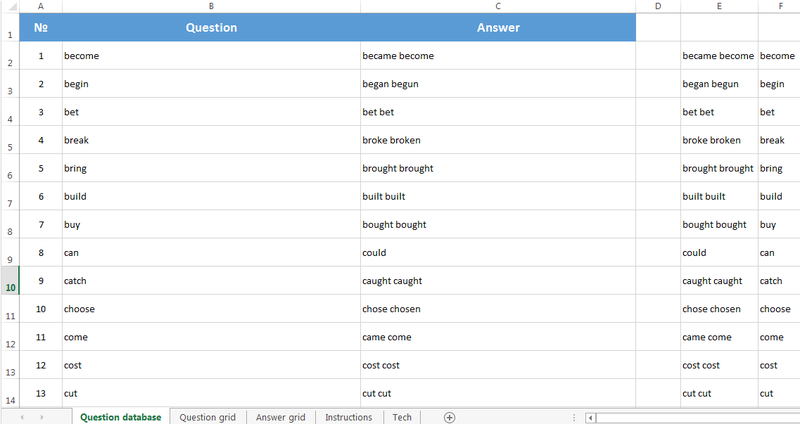 Your questions and answers will be automatically copied into the tabs Question grid and Answer grid. First, print the tab Questions grid using the following settings: Print active sheets + Landscape orientation + Normal margins (Left: 0.7”, Right: 0.7”) + Fit Sheet on one page. 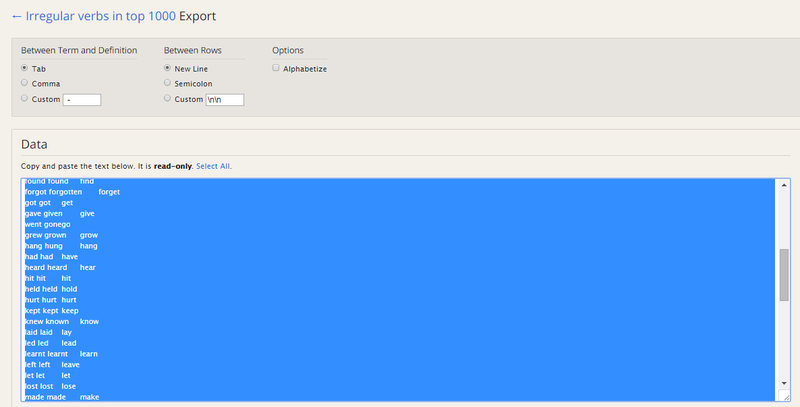 Second, insert the printout back into the printer and print Answer grid with the same settings. Voilà! 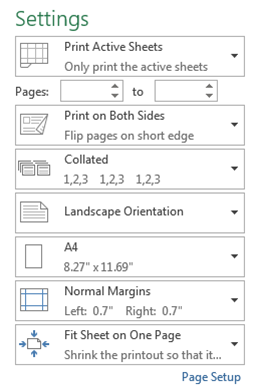 NB It should also be possible to Select both grids and print them using the following setting: Print on Both sides (Flip pages on short edge) . However, unfortunately about 50% of times it gets printed on two separate sheets (this seems to be a known issue with Excel). If you press F9, the file will generate another random set of cards. This will delete the previous board, so don’t press F9 until you’ve printed both the question and the answer grids. Creating a pdf worksheet . If you want to share your worksheet, you can use a pdf printer and print your grids into a pdf file that can be printed without any hassle with the settings. Below are some games that can be played with a set of Question/Answer cards, some widely known and some that I only learnt about while on my hunt for games. 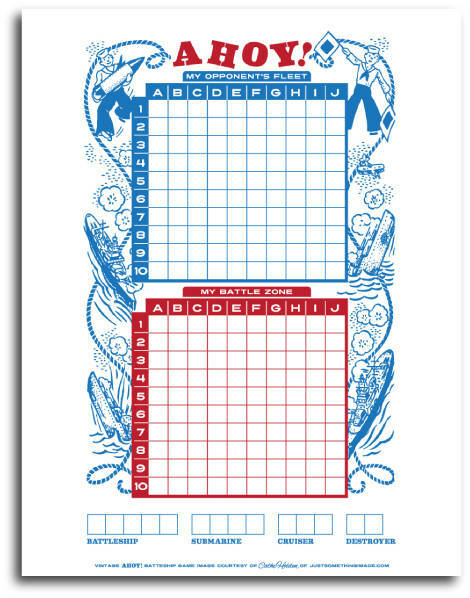 No adaptation is required for any of the games – simply print out the board and a set of Questions/Answer cards and you’re done. At the start of each turn, a player picks a card with a question. If they answer incorrectly, they miss the turn and the card goes back into the stack. A tip: if you’re creating a randomized set for revision, you can create different versions for different pairs (by pressing F9, as explained above). 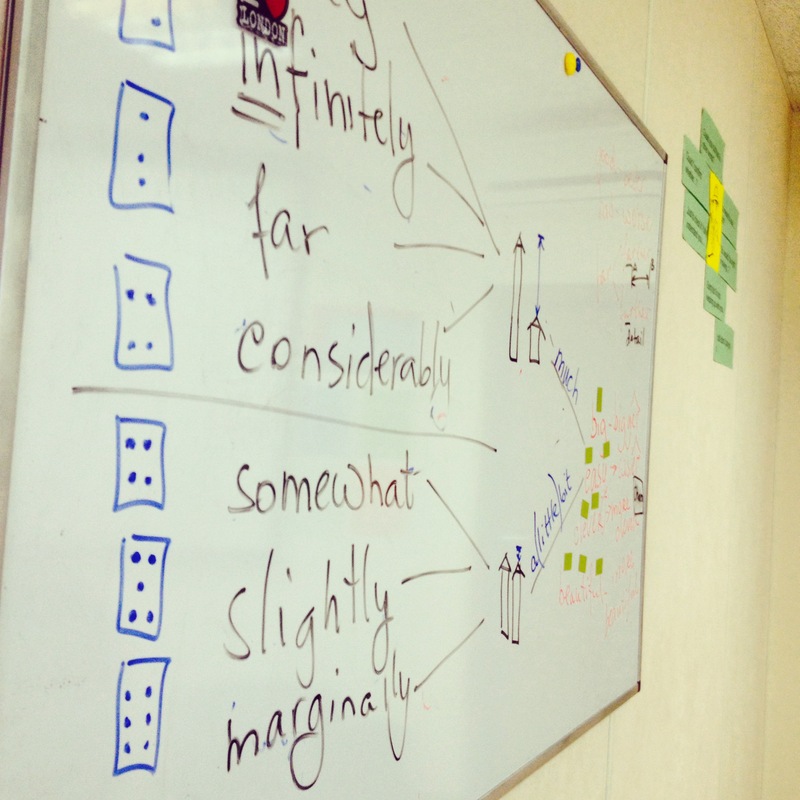 This way the students can share the cards that have been played with fast finishers. Rules: The goal of the game is to win more squares than your opponent. Players draw lines on a grid, and the player that ‘completes’ the square wins it. Links: check out this beautiful free template. The number of players: 2 (or two teams of two for the adaptation). 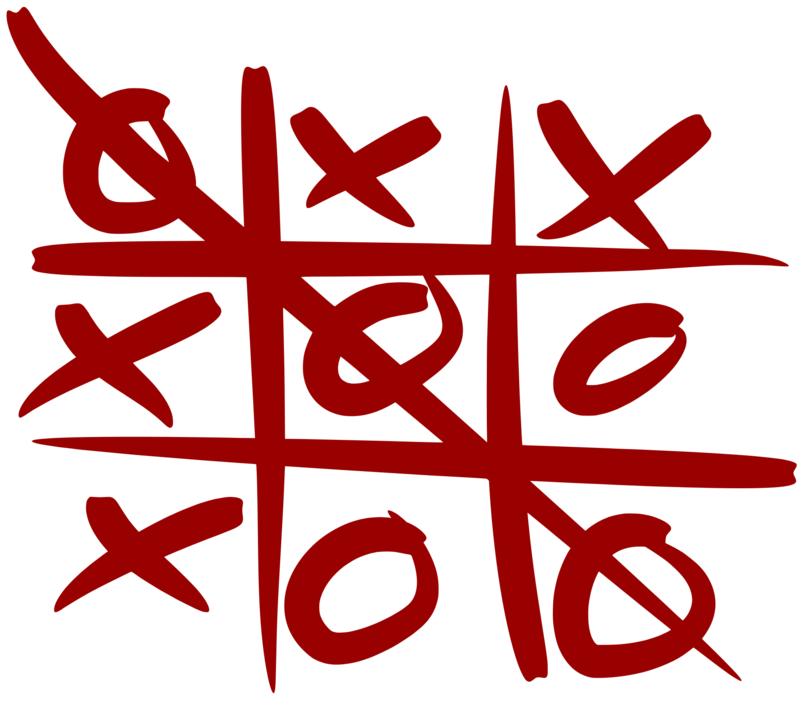 Probably everybody knows the rules: this is a paper-and-pencil game for two players, X and O, who take turns marking the spaces in a 3×3 grid. 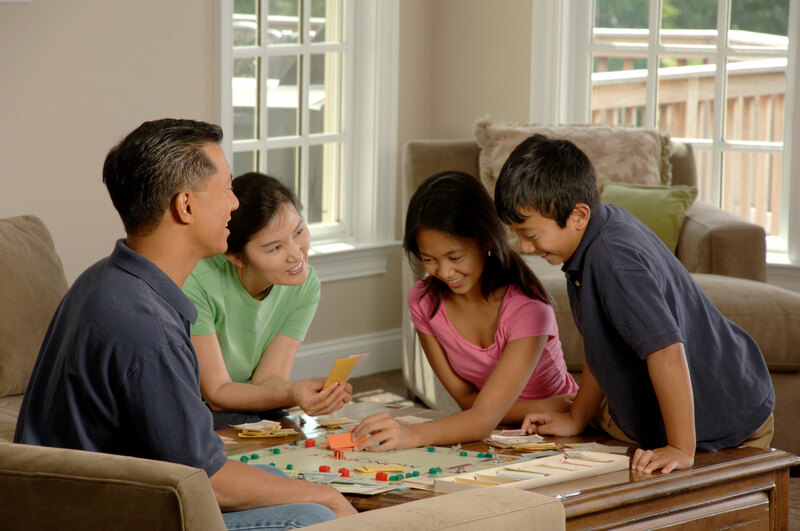 The player who succeeds in placing three of their marks in a horizontal, vertical, or diagonal row wins the game. 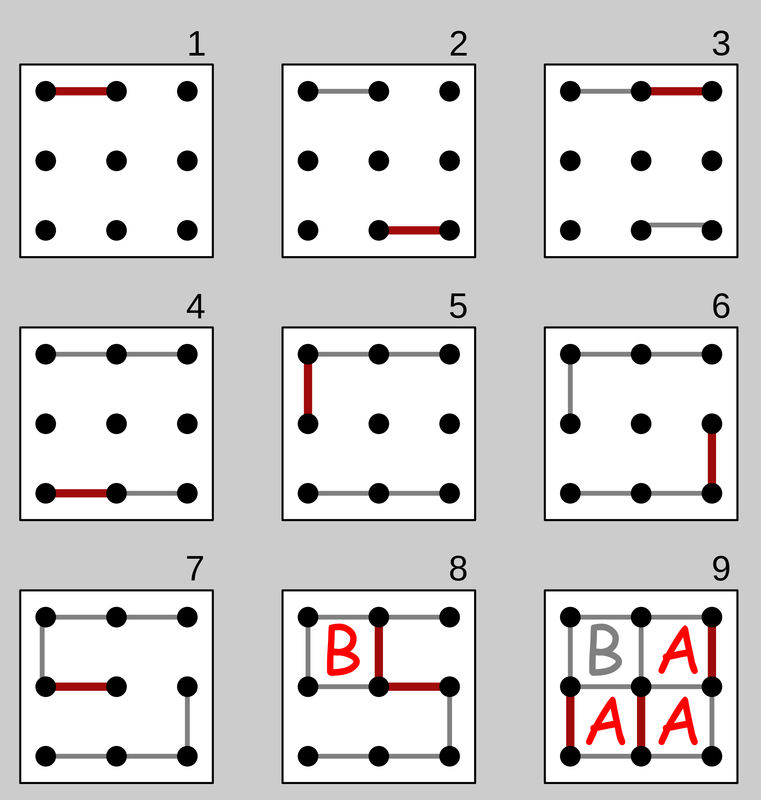 There is a nice adaptation that takes a lot more time to play: players play on a 7×7 grid, trying to place five marks in a horizontal, vertical, diagonal row or a cross. Rules: These games are played on a hexagonal grid of any shape. 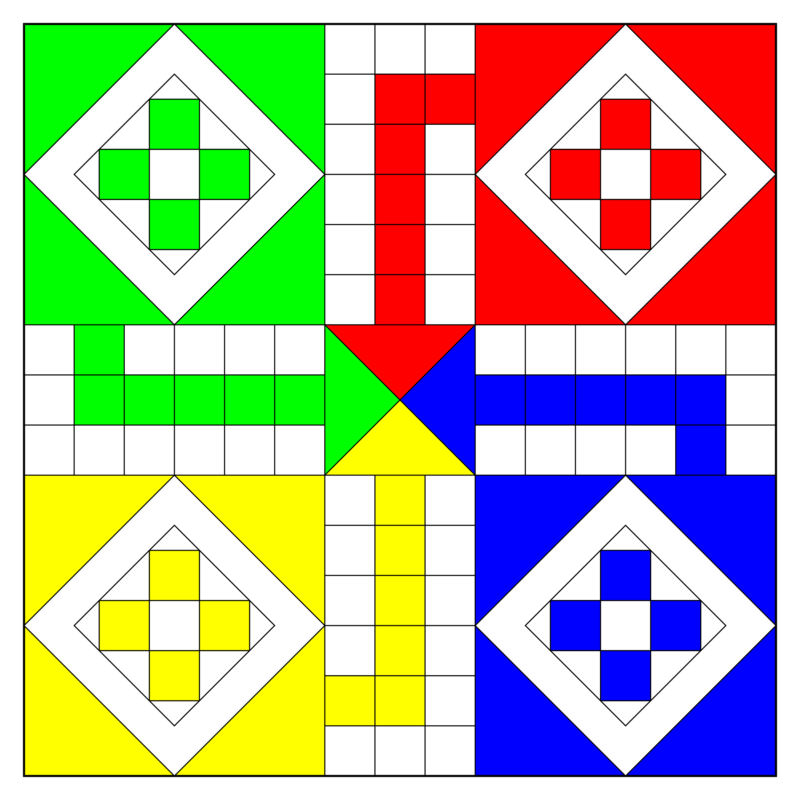 Each player is given a colour. Players take turns colouring a single cell within the overall playing board. 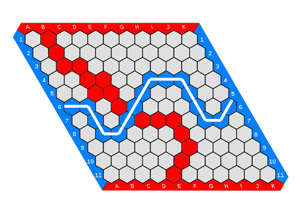 The goal for each player is to form a connected path of their own stones linking the opposing sides of the board marked by their colors, before their opponent connects his or her sides in a similar fashion. 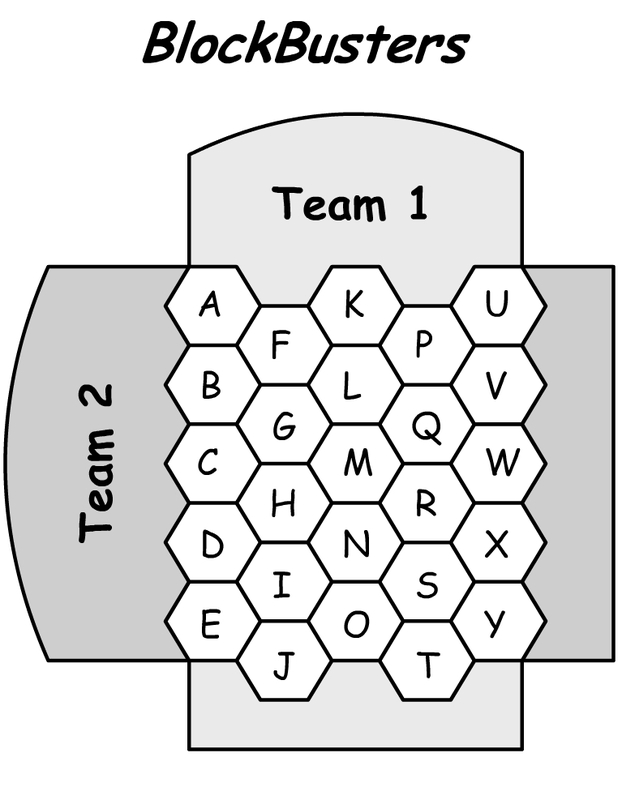 Links: Download a powerpoint template created by Adam Simpson (Blockbusters), this template (Blockbusters), this template (a hexagonal grid for three players), or search for ‘Blockbusters template’ or ‘Hexagonal grid’ in Google images. Links: This is another oldie – see the rules and a board on Wikipedia or download a board from here. 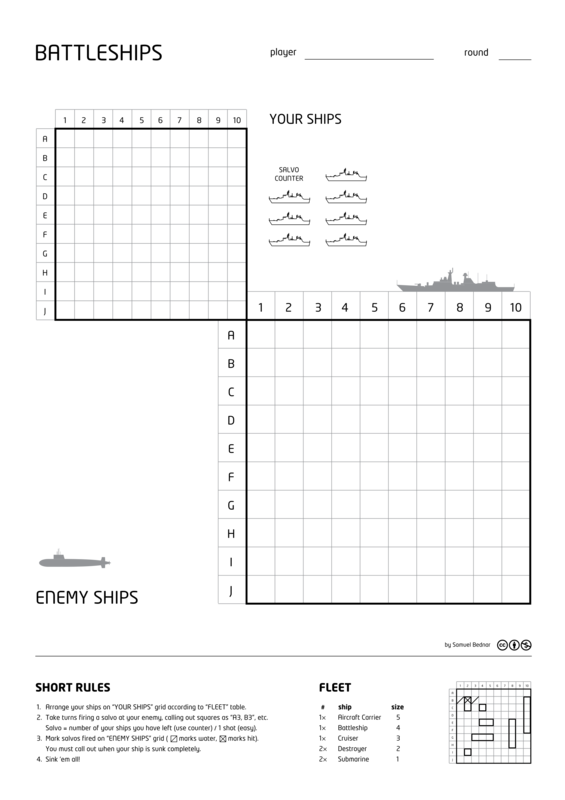 The number of players: 2-4. 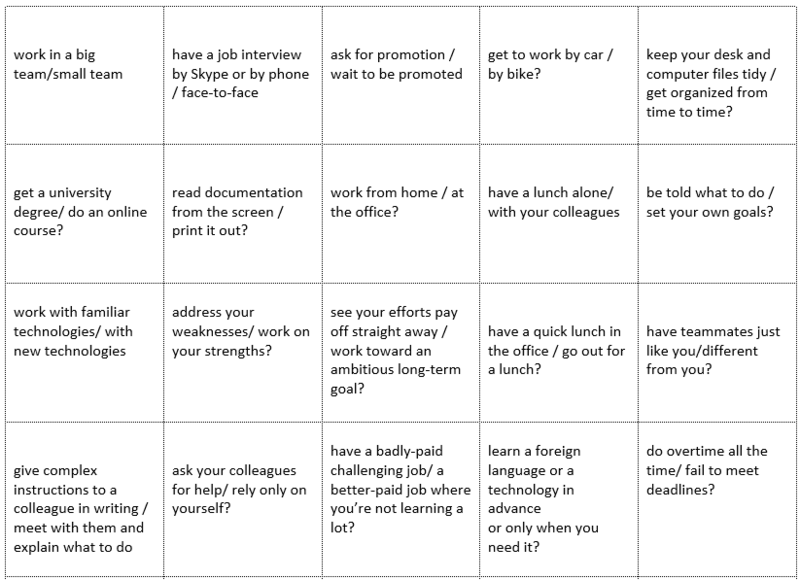 Links: See the rules and a board on Wikipedia (you’ll need a colour printer to print this one out). Each group will need a dice and counters. If the student lands on a square with a snake’s head, they slide down to its tail. If the student lands on any other square, they have to pick a card and answer it correctly (if they make a mistake, they return to the square from which they started the turn). If they land on a square at the foot of a ladder and answer the question correctly, they climb the ladder. Links: You can print the board from British Council website (registration required), from here or you can find boards using Google image search. 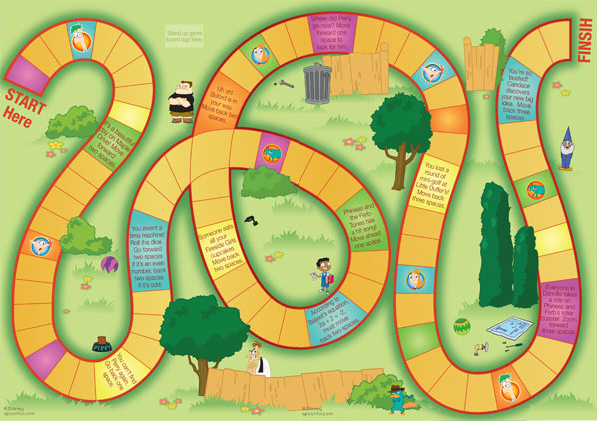 There’s also a variation called Chutes and Ladders (download a template from here). 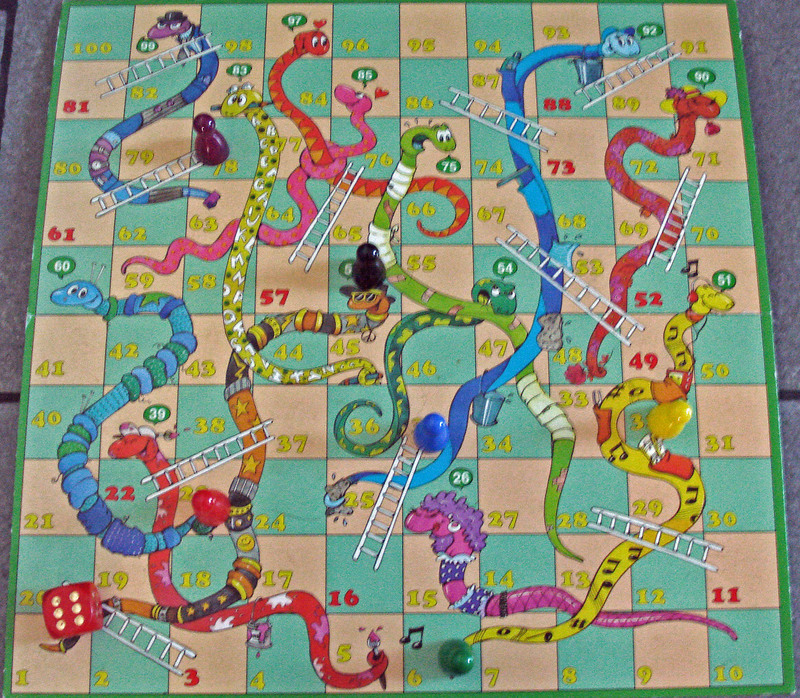 This game is somewhat similar to Snakes and Ladders: landing on a goose allows the player to move again by the same distance (see Wikipedia for the rules). Finally, simply use a blank board template – a simple Google Image search returns lots of sites. I personally really liked this page. However, the source of questions that is probably a lot more relevant to teachers out there is Quizlet – a site that features a huge number of flashcard sets (Google search ‘quizlet fce transformation‘ alone returns no fewer than 2370 results). 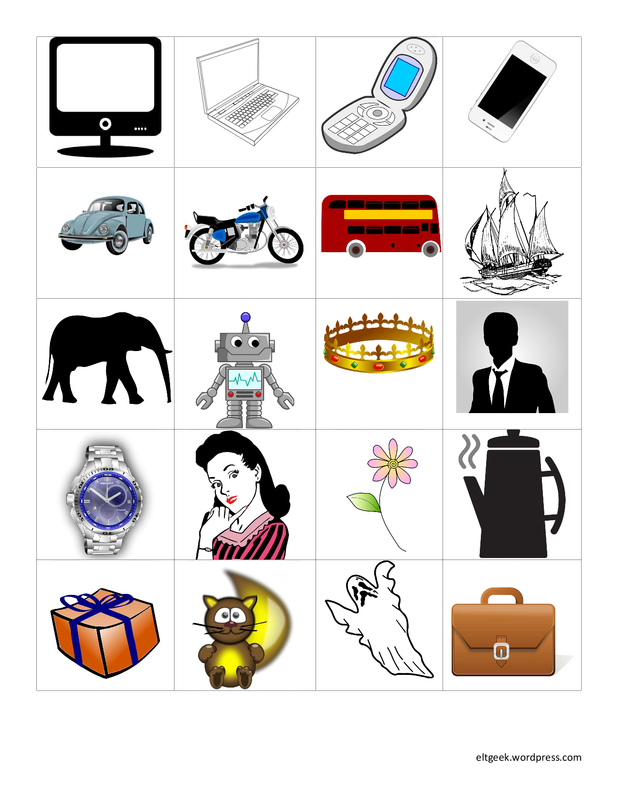 These flashcards can be exported and inserted into Excel in a couple of clicks. Finally, open a copy of the template and insert the data. 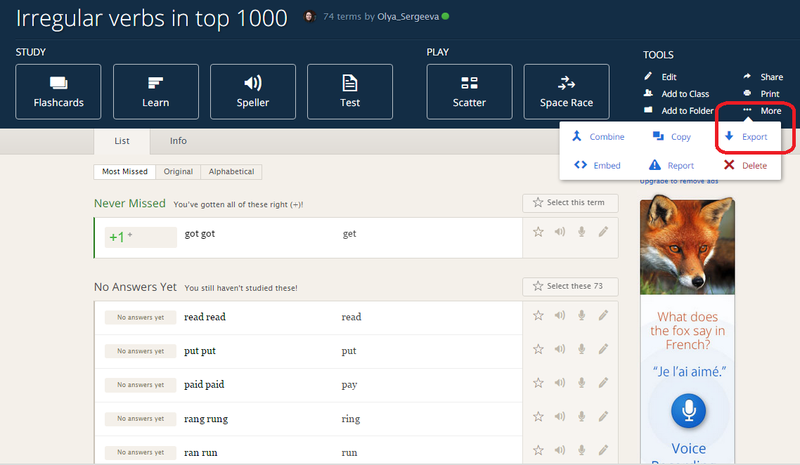 Quizlet changes the order (storing first the answers and then the questions), so you’ll have to paste the data into some other columns, and then copy the second column into the ‘Questions’ column , and the first one into the ‘Answers’ column. You’re done! The games shared here have spiced up my classes and saved me a lot of time. I hope you’ll find them useful too. Let me know what you think!